Recently over the last few years, I've had quite a change in thought when it comes to horror movies. I've never been a big fan of the genre and rarely looked forward to any scary movies coming out in the cinema. However this has soon changed with the likes of 'The Babadook', 'It Follows' and this years 'The Witch' to thank for doing so. Another film that impressed me was James Wan's 'The Conjuring'. 3 years later, it is now time for a sequel and we all know how hit or miss they can be. Despite looking to potentially end their journey as paranormal investigators, Ed (Patrick Wilson) and Lorraine Warren (Vera Farmiga) are brought to Enfield, a borough in London where a family are being terrorised by an evil presence. There they meet the Hodgson family with mother Peggy and her four children including daughter Janet who shows signs that she is being possessed. As they try and banish the evil spirits, the demons start to set their sights on hurting the Warren's themselves. 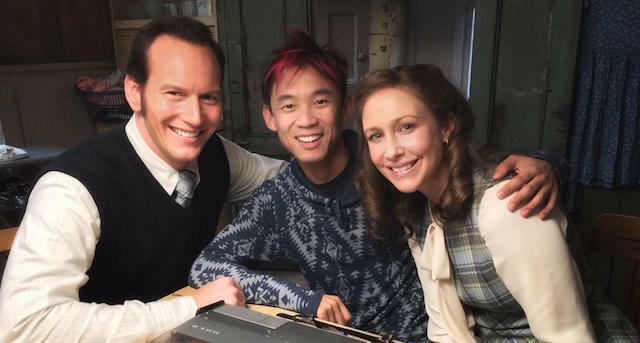 James Wan returns to the sequel of his successful horror film 'The Conjuring' and it clearly shows that this man knows exactly what he is doing when it comes to the genre. With the previous film in the franchise as well as helming the Insidious and the original Saw movie, Wan shows his experience and uses it incredibly well. The man truly knows how to frighten people and doesn't need to just have loud noises and jump scares to do so. He creates an atmosphere that is chilling and creates tension that leaves you anticipating the scare, which almost always delivers. His timing is fantastic within his scenes and he knows the right moments to strike to get the best effect. Wan also does a great job of not giving too much away so you don't ever know exactly what is going on and it frightens you in ways that you don't expect. Wan also uses a wide range of shots showing his talents as a filmmaker and also in many ways on how to set things up. The use of beautiful continuous shots as well as aerial shots are great and shows his capabilities. The film definitely succeeds as a great horror film by creating so many scenes that really hit the mark. This thoroughly helped by the atmospheres that alone are creepy enough. Everyone as a child had moments where they were scared within the comforts of their bedroom. This gives the audience something that they relate to as they remember how their mind used to play tricks on them in the dark after hearing a noise that had spooked them. The jump scares are actually done incredibly well in this and actually are frightening. I jumped pretty high in the scene where Ed and Peggy go into the depths of the home in what was pulled off very well and to great effect. And due to this film, I'll be a lot more wary of scary artwork in what was one of the more terrifying parts within the film. In this instalment of the Warren's lives, the film features and focuses quite a lot on the children in this. Out of the 4 children, Janet is the one who finds herself unlucky enough to play host to the demonic spirit. Young actress Madison Wolfe puts in a very good performance as the 11 year old who's helpless in this situation. I was impressed by her in this role and she deserves a lot of praise for her work. The other children do well throughout the film and genuinely seem terrified by everything that is going on which is vital to make it seem as believable as possible. Sometimes with child actors it can damage the film but thankfully here, not only did they deliver but overall made the film even better. You can't speak about this film without talking about our heroes the Warrens portrayed once again by Vera Farmiga and Patrick Wilson. The pair are fantastic once again and really enjoyable to watch. They are believable as these paranormal experience and really deliver in these roles. Wilson is fantastic and shows the bravery and courage as well as the light hearted, family man that Ed is. Farmiga has a bit more of an emotional role in this film as she is starting to want to get away from the supernatural occupation and seems to be starting to crack. She is also shown to be avery caring woman and really works well in the scenes where she has heart to heart talks with Janet and then one when pleading with Ed that is heartbreaking. I really enjoyed watching these characters and due to them, I am fully up for a third film involving the pairing. One of the biggest problems I have sometimes with horror films is the poor and low quality production. However that most certainly isn't a problem with this film as everything is created incredibly well from the settings, the effects and even the acting. Everything seems real which helps oh so much in these types of films because if you don't make it seem realistic, the films just gonna fail miserably. I only have one gripe with this film and it does have something to do with the story telling and in particular the scenes where it involves having to prove the activity of the spirits. There seems to be a lot happening that would suggest what's happening but they don't seem to take action to capture concrete evidence. Also they try and rubbish it off at one point claiming Janet is faking the whole thing which makes you question, why didn't they take into consideration of her being possessed to do things like each other time? This did bother me at the time but really is the only gripe I have with the film. A thoroughly enjoyable and fright filled film, I would highly recommend this film. I'm not the biggest horror fan but this film really amazed and surprised me. Great work by those involved from the director to the whole cast. So have you seen 'The Conjuring 2'? If so what did you think of it? I hope this review was helpful for if you were planning on seeing the film and if you do choose to see it, I hope you enjoy it as much as I did! Once again, thank you so much for reading my review, it is much appreciated!